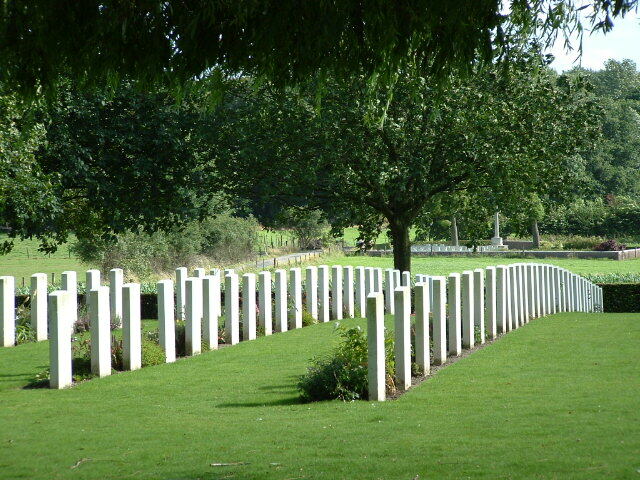 Ploegsteert Wood lies some eight miles south of the city of Ypres (Ieper) and therefore, technically, just south of the area known as the Salient. There were no major battles fought here, although the Battle of Messines will loom large in our narrative throughout, and the wood itself remained in British hands for much of the war, but every day, week after week, month after month, year after year, men from both sides fought and died in the trenches and dressing stations within and surrounding the wood. Our tour begins as we turn off the Ploegsteert-Messines (Mesen) road, where CWGC signposts point the way towards the British cemeteries on the northern edge of, and within, Ploegsteert Wood. 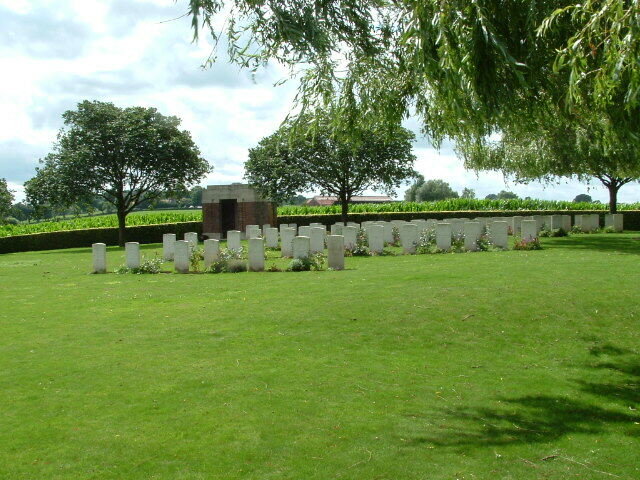 Prowse Point Military Cemetery, our first port of call, was originally in use between November 1914 and April 1918, although, at the time of writing, the last burial, that of Australian Private Alan James Mather, took place as recently as July 2010. 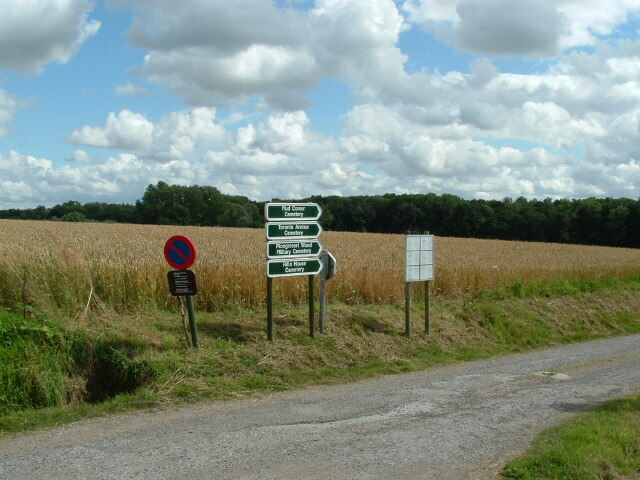 The road to Prowse Point, with the northern edge of Ploegsteert Wood on our right. 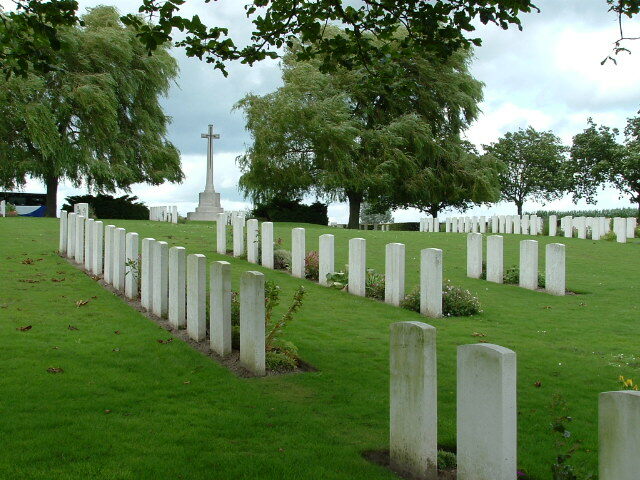 The classic view of Prowse Point Military Cemetery, with Ploegsteert Wood in the background. 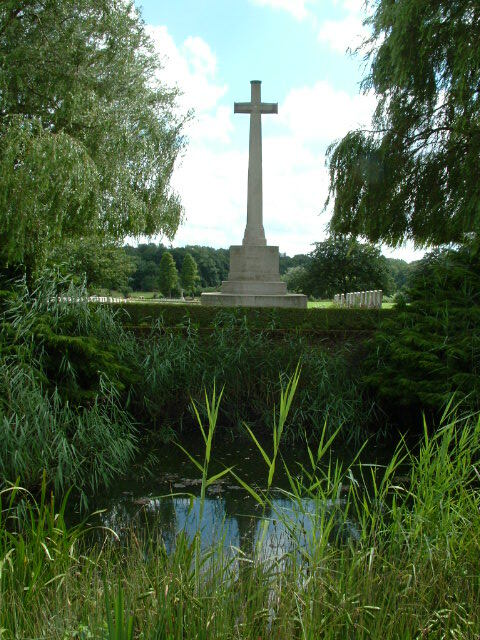 If you look carefully you can just see the second cemetery we will visit, Mud Corner, in the distance to the left of the Cross of Sacrifice. They say the pond is on the site of what was once the British front line, and I see no reason to believe that this wasn’t part of a trench system at some time, but the front line proper was actually some yards into the field behind us. 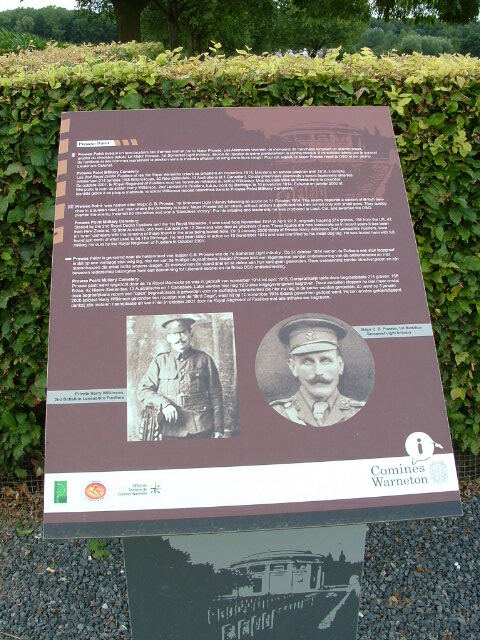 An information board (we will encounter many of these on our travels) outside the cemetery tells us a little about Major (later Brigadier General), C. B. Prowse DSO of the Somerset Light Infantry, after whom the cemetery is named. 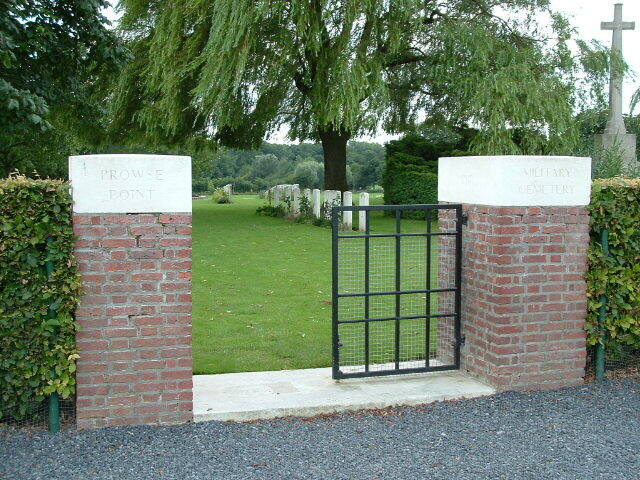 Prowse displayed great heroism during the fighting here in October 1914, but was later killed commanding the 11th Infantry Brigade on the first day on the Somme in 1916, and is buried at Louvencourt Military Cemetery. 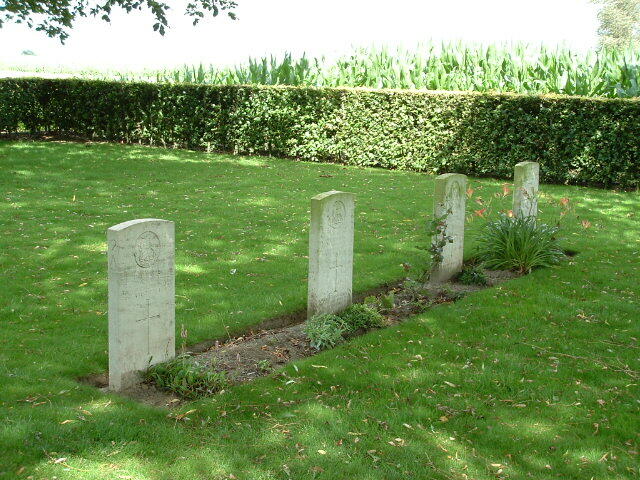 Prowse Point is the only cemetery in the Salient named after an individual. The cemetery entrance, with Plot II Row C visible in the centre of the photograph. Plot II Row C with Plot III in the background. 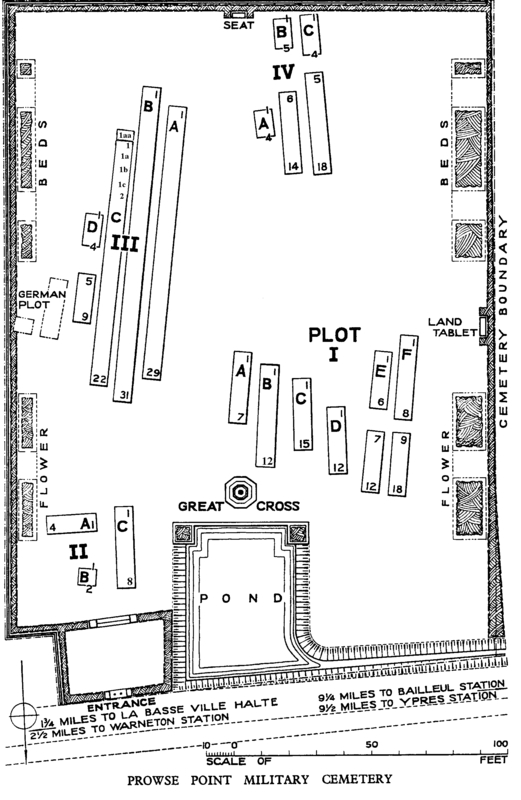 The cemetery plan, by kind permission of the CWGC, can be found here: Prowse Point Military Cemetery Plan. 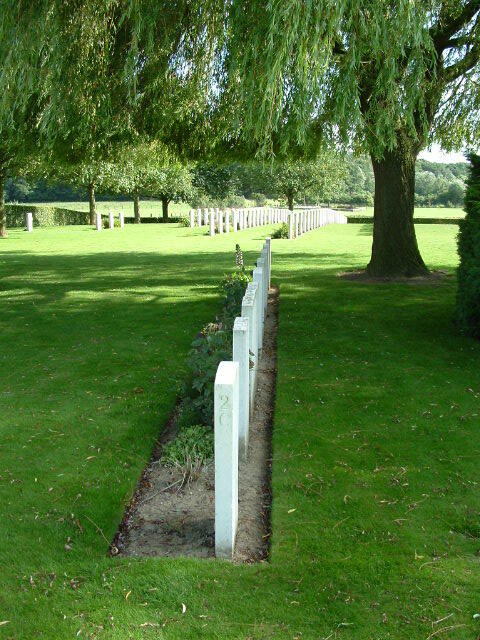 Headstones of Plot III. Mud Corner Cemetery can this time be clearly seen beyond. Looking west at Plot I. 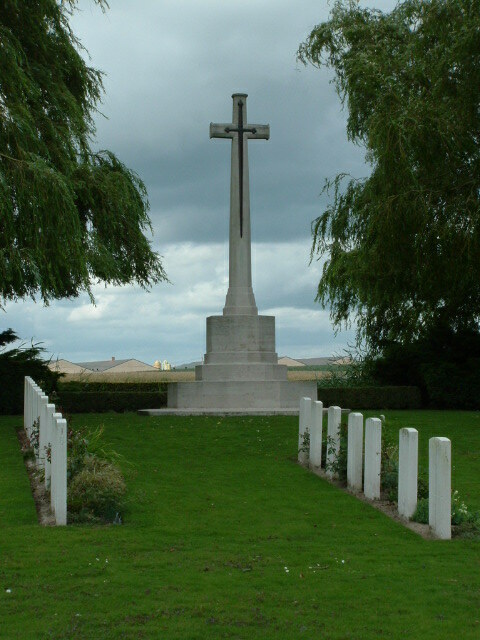 View looking north from near the south eastern edge of the Cemetery, with Plot III in the foreground and the Cross of Sacrifice on the skyline. It is worth noting that British troops operating in this area behind the front line (beyond the top of the hill) would at least have been safe from the guns of German snipers. 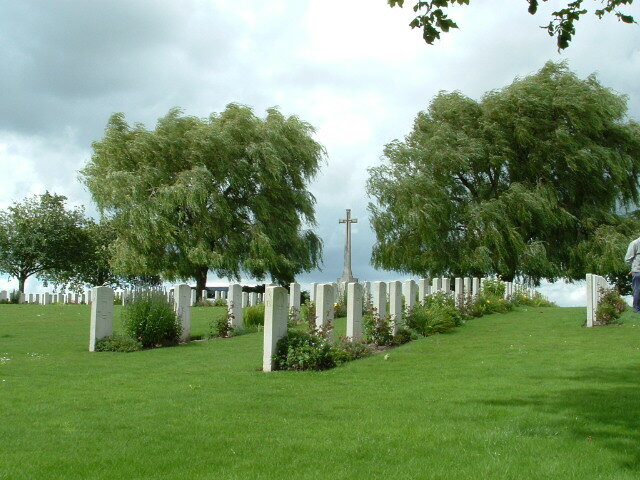 View across Plot IV at the south western edge of the cemetery, looking north east towards the Cross. At the time of writing, and with the exception of Tyne Cot, this is the only occasion I can remember encountering a coach load of visitors at any of the cemeteries I have visited. I have no idea whether this is a good thing or not. 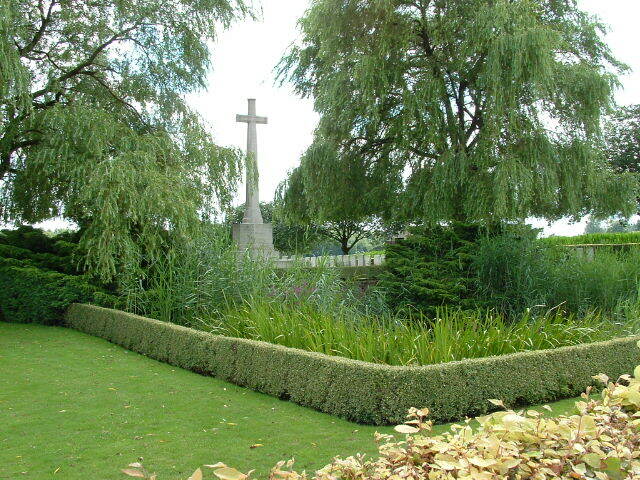 View from Plot I of the Cross of Sacrifice. Beautiful Prowse Point Military Cemetery. 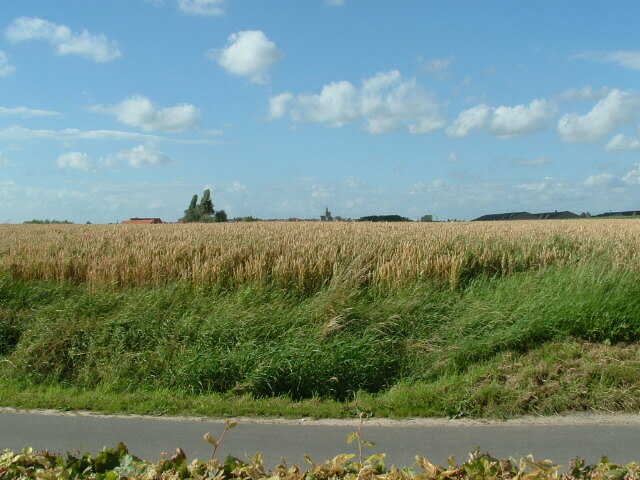 Looking north across the cornfields towards Messines church from the entrance to Prowse Point, in effect the British front line from late 1914 until June 1917. The German front line crossed the fields a couple of hundred yards away before turning south down the eastern edge of Ploegsteert Wood; these are the very fields where some of the famous 1914 Christmas truce photographs were taken. 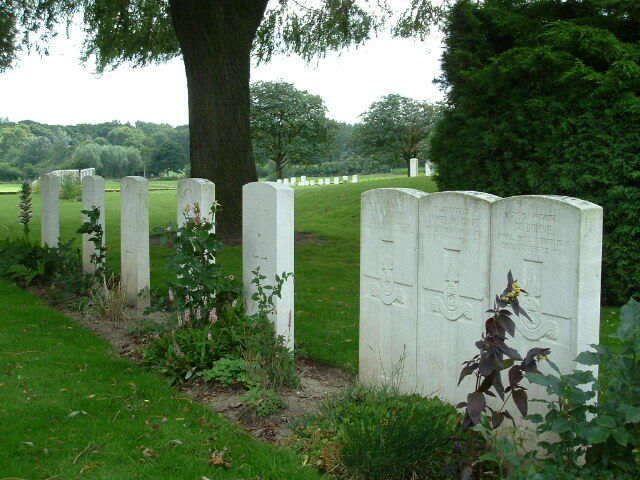 The 1st Battalion the Royal Warwickshires took part in the truce here; poignantly, a number of the graves in the previous photos are of 1st Battalion Warwickshire men killed just before Christmas. It makes you think. 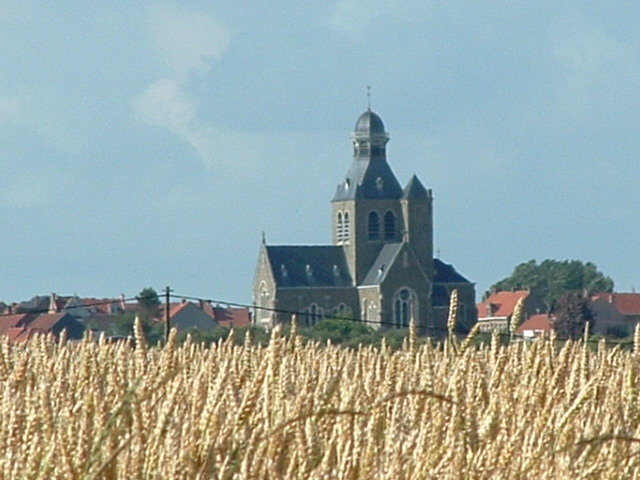 Messines itself was in German hands for much of the war; consequently, by 1917 the church had been reduced to rubble by British artillery. And not just because Hitler served as a runner in the trenches hereabouts. The rebuilt church of St. Nicholas is a prominent and useful landmark when touring the area. 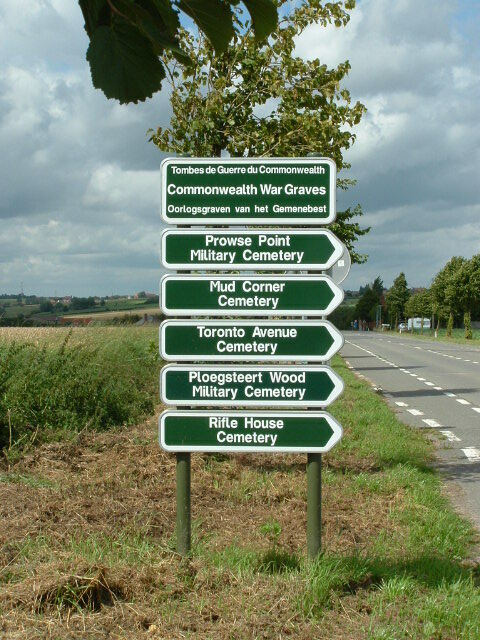 Immediately to the east of Prowse Point, CWGC signposts point us down the road towards Ploegsteert Wood. Now, before we move on, if you wish to view a further series of photographs taken on a more recent visit, you might like to click on the following link: A Return to Prowse Point . If not, our tour continues in ‘A Tour of Ploegsteert Wood – Part Two’, as we head down the track in the picture above towards our next stop, Mud Corner Cemetery. Beautiful pictures! Those cemeteries are very well kept. Mrs. B!!!!! How’s old Balders? 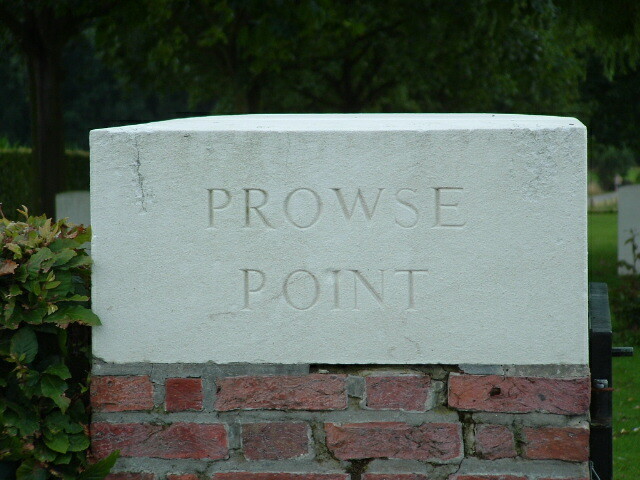 We shall visit Prowse Point next summer/autumn. It’s a date. Is everyone dead here, or is it just the funny smell? I was looking for the remnants of something else… Nice pics, btw. Most kind. I’m sure you-know-who will point you in the right direction with regard to the remnants. If he hasn’t already. Hurrah for Ye Olde Big Note! I am the grandson of F. E. Long who was killed on the December 3rd 1914. I have visited his grave twice with my father. Last time my son was with us as well. We’re hoping to visit Prowes Point soon on the centenary of my grandfathers death. Hello Robert. Thank you so much for your comment. I love the idea of three generations visiting the previous generation. One of the first cemeteries I ever visited, Prowse Point. It is a beautiful setting. Enjoy your December trip. Btw, I hope you had a look at the ‘Return to Prowse Point’ post while you were here. 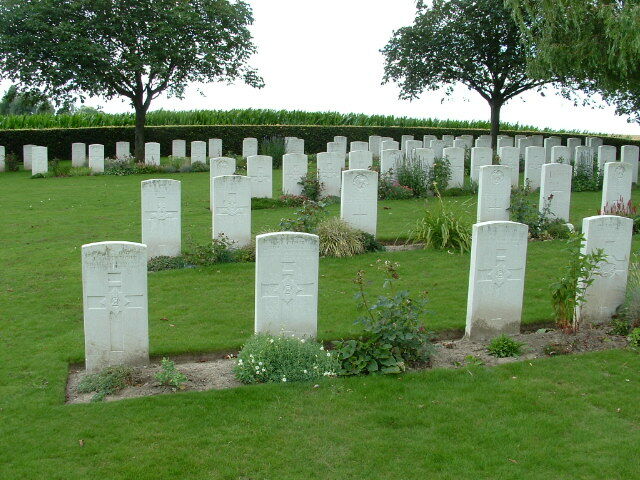 I am quite amazes to find that my uncle James Gallagher from Creslough Donegal Ireland is buried here he is one the very first along with two other who died on 20 Nov 1914. age just19. he is in plot 11 c 6 near the gate . this has been an emotional but happy time as we had no information except he died in ww1…my father would have been twelve then he went off to war ..We began looking into his story more after my older sister now 80 had a ‘spirit message ‘ .. from James Patrick Gallagher ..quite fascinating ! we would love to visit I have seen photo of his grave her together with his fellow soldiers .. Just to confirm that their remains are her and not just a stone ?.. It looks so peaceful and also so tragic . we would love to see photo of James did the army take photos and where would we find ne ?.. pls help with any info . ..My brother was named after him so that is something !.. kind regards Eileen Gallagher ..
Hi Nigel. Also: ‘Until early 1918, German trenches were usually overprinted in red, with British or Allied trenches (where shown) in blue, but thereafter the colours were usually reversed for the remainder of the War with German trenches shown in blue to match the French trench map colour system.’ This from the National Library of Scotland trench map collection (vital resource). Note the word ‘usually’. I have a book entitled ‘Mapping the First World War’ but I cannot find any further info in it. I might do a serious post on trench maps one of these days as I have access to loads of them (many unpublished) of all sorts and all sizes – what do you reckon? the Queen’s archive which shows all the associated regiments’ war diaries, page by page, including our own beloved ‘Shiny Twelfth’. And if I say so myself, and without being too much of a smartass, and my work colleagues would back me on this, I know as much, more, about Billie Neville on 1st July 1916 as anyone you are likely to meet. This post includes a link to the research I did on Billie a few years back.